My family has been on a taco kick lately mainly because we found these amazing tortillas at Costco. They come uncooked and you have to cook them a few minutes on each side. My husband says they remind him of the awesome tortillas that you get at Café Rio in Utah. Anyways we have been eating them so much I was starting to get a bit burnt out and looking for an alternative. I found this recipe over at how sweet it is. It was an amazing recipe full of flavor. It was super simple to make and it used some of our awesome tortillas. So all in all I would say it was a hit. 1. Season chopped sweet potatoes with salt, pepper, cumin and smoked paprika. Heat a large skillet over medium heat and add olive oil. Add onions and garlic, tossing to coat, then add sweet potatoes and stir. Cover and cook for 15-20 minutes, until sweet potatoes are just softened and cooked through. 2. While sweet potatoes are cooking, combine sour cream adobo sauce, lime juice, and lime zest. Stir to combine. 3. Once sweet potatoes are cooked, add in black beans and toss well. Cover and cook again for 5-6 minutes until everything is warmed through. 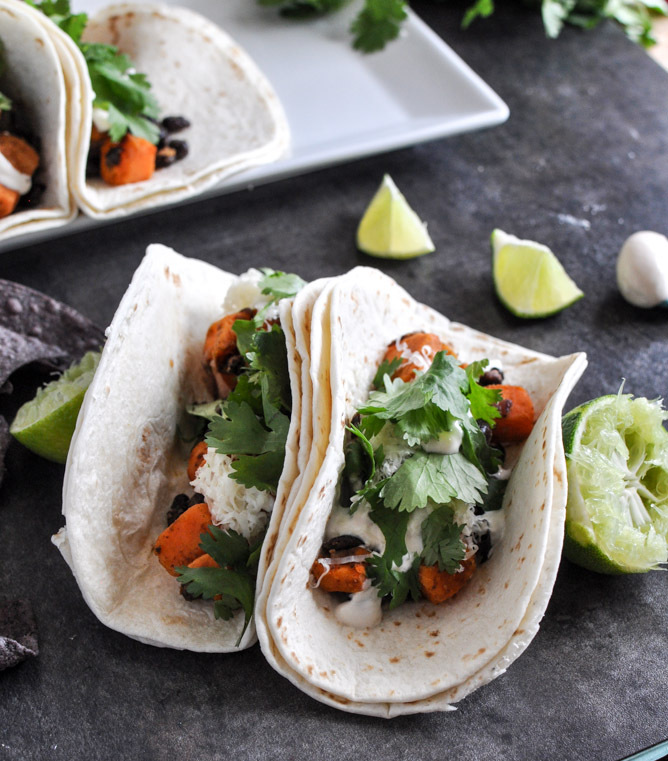 Heat tortillas and serve sweet potato mixture topped with cheese, Queso Fresco, Chipotle lime Sauce, and cilantro. So I know everyone has there own version of sweet potato casserole. The casserole with the marshmallows on top. It is a favorite in our household. 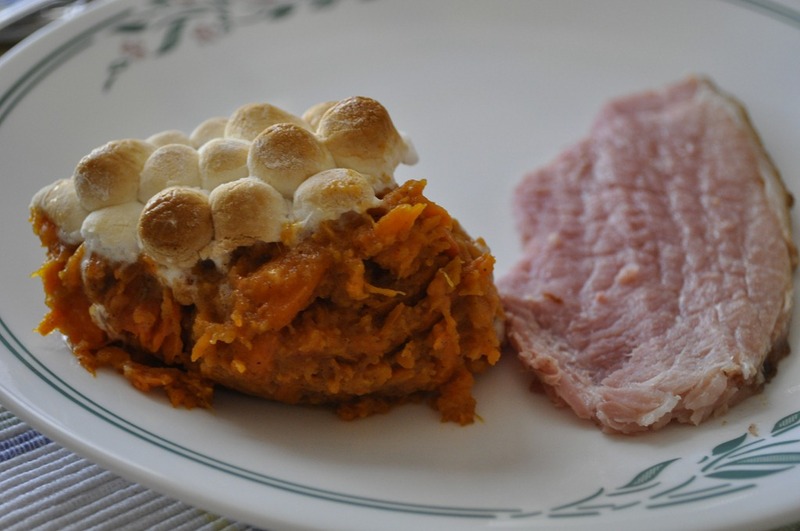 In fact when my husband and I were first married we would just buy a can of yams at the store and make it for our dinner side dish any time of year. Over the years I have adapted my sweet potato casserole a bit and to serve along with our ham I made a mashed sweet potato casserole. It can be adapted to fit anyone’s taste by adding less sugar, rolled oats, pecans, and any variety of spices. Make it your own and I hope you enjoy. 1. Wash and peel the sweet potatoes. Then boil until fork tender. 2. When the sweet potatoes are fork tender drain and add to a bowl. Mash up the sweet potatoes until the desired consistency and then mix in the butter, brown sugar, and cinnamon. 3. Place in a 8 x 8 baking dish and top with marshmallows. Bake at 350o F for about 10-15 minutes or until marshmallows are brown and sweet potatoes are heated through. * Mix in chopped pecans or rolled oats for added flavor. 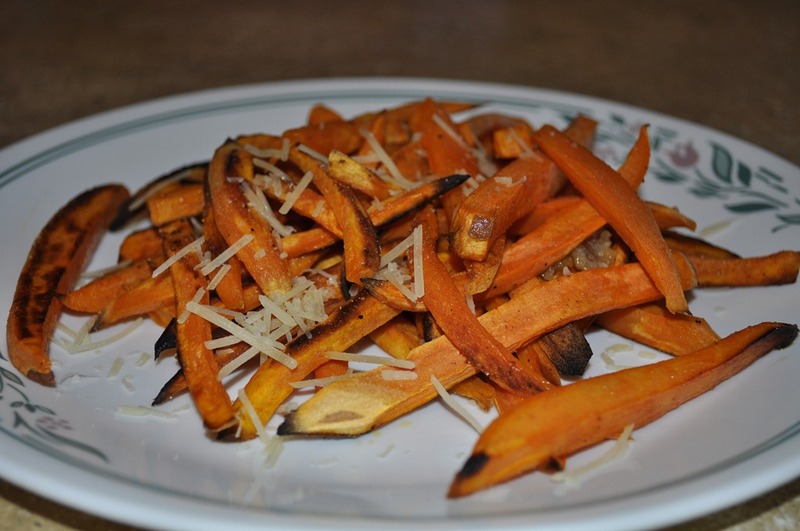 Sweet potato fries seem to be all the rage now and you can find them at a lot of restaurants. They are a yummy side dish to any meal. I bake mine and that makes them even healthier. Plus my kids love to gobble them up which is just another way to get some more veggies into them. Baking them doesn’t get them supper crispy but we still love them a lot. Start by peeling your sweet potatoes and slicing them into thin strips. Toss with olive oil and season with you favorite salt, garlic powder, pepper, season salt, garlic salt, onion powder, paprika. The possibilities are endless. Preheat the oven to 450o F and bake for 20 minutes. Make sure to turn the fries at least twice and watch to make sure they don’t burn. Once mine were done baking I sprinkled with a bit of shredded parmesan cheese and then enjoy! 1. Peel sweet potatoes and cut into thin strips. Toss in olive oil and then season with you choice of seasoning. 2. Preheat oven at 450o F. Bake for 20 minutes. Stir fries at least twice during baking so that they brown and not burn. Sweet potatoes are always welcome in our house. 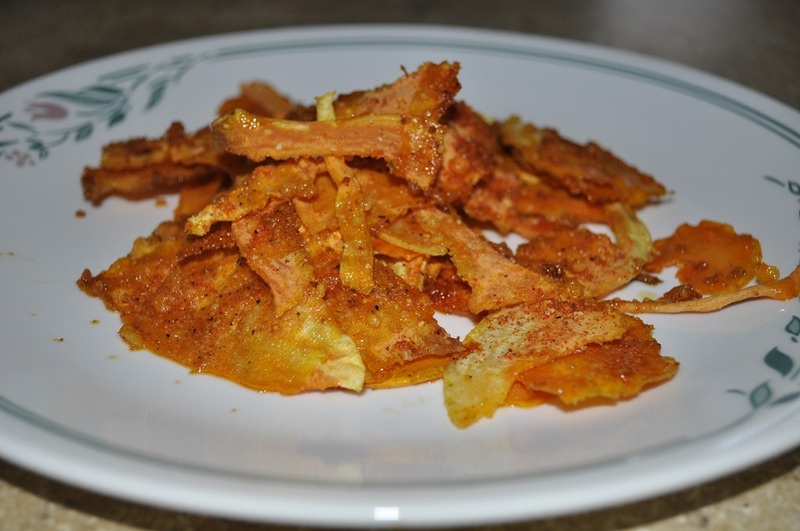 We love sweet potato fries, mashed sweet potatoes, and now a new favorite sweet potato chips. Simple to make and full of flavor. Just watch them really carefully in the oven or they will burn. Trust me I am speaking from experience, I stepped away for a minute and they were burnt to a crisp. 1. Preheat oven to 375o F. Peel the skin off the sweet potato and discard. 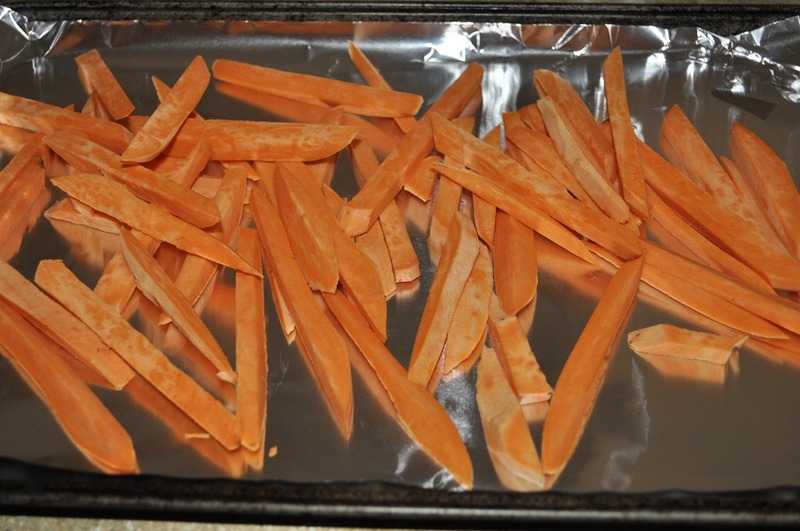 Continue to peel the sweet potato so you have lots of thin strips of the sweet potato flesh. Put these strips onto a parchment-lined baking sheet. Make sure to have one layer on the baking sheet. If you throw all of them on they will not get crispy. 2. Mix the Parmesan cheese, garlic salt, paprika, salt, and pepper in a bowl. Drizzle the sweet potatoes with olive oil and sprinkle a little of the Parmesan cheese mixture over the top. The mixture can be a bit over powering if you use to much. Bake for 10 minutes or until the edges are just slightly turning light brown and the strips are crisp. Watch carefully so they don’t burn.